This product is classified as ‘very high risk’ in nature due to its location and geopolitical situation of the region. Next Mining Boom advises that extra caution should be taken when deciding whether to engage in this product, however if you are not sure whether it is suitable for you we suggest you seek independent financial advice. A number of multi-million ounce discoveries have been made in the West African nation’s gold belts, while more than a handful of big name mining groups have established operations there, including the likes of Randgold Resources (LON:RRS) and AngloGold Ashanti (JSE:ANG). 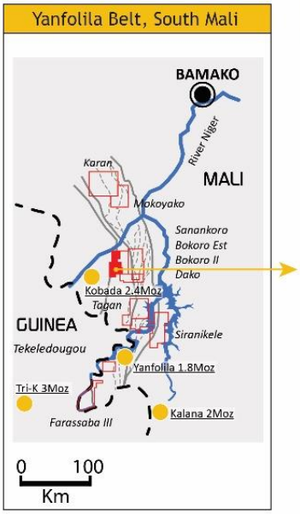 Encouragingly, Cora’s 1700 square kilometre portfolio is in established gold areas in the Yanfolila Gold Belt in Mali and the Kenieba Window along the Mali-Senegal border, and has multiple gold targets with drill intercepts. More than US$10 million has been spent on the project areas over the years, meaning that Cora has a good idea of the potential of the prospects. These results further enhance Sanankoro’s multi-million ounce resource potential. Yet, what these results will ultimately show is yet to be determined, so investors should take all publicly available information into account and seek professional financial advice before making an investment decision. 17m at 6.8 g/t gold, including 1m at 102 g/t gold. Cora is waiting on its final batches of drilling from the labs, but any further results like those seen in the last two announcements should please the market. It kicked off drilling first at its flagship Sanankoro Project, where drilling stages 1 and 2 have now been completed. Drilling continues to demonstrate the large-scale potential of the Sanankoro gold zone, having revealed some excellent grades and widths, as well as a deep weathering profile which signifies the potential for lower cost mining and processing. Assay results from the most recent drilling extends the mineralised strike at the Sanankoro gold zone to over five kilometres, and includes an exceptionally mineralised intercept of 35.7g/t gold over 1m. 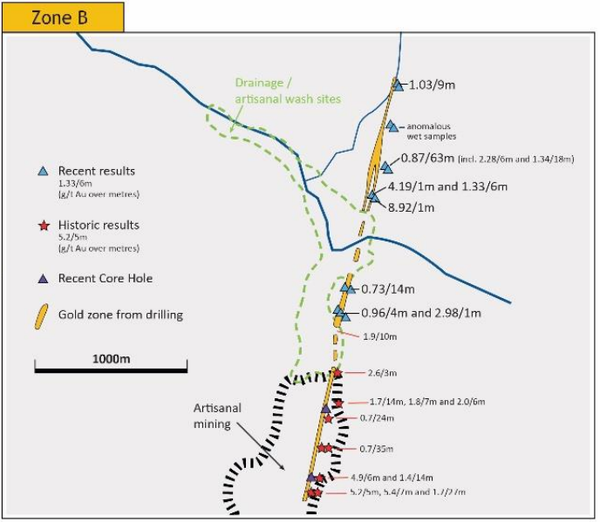 Cora was able to join together the previous Zone A and Zone B mineralised areas defined by historical drilling to create a continuous strike zone and extend to both the south and north. Sanankoro has the potential for standalone mine development and holds potential to be a million+ ounce deposit. Following that exploration at Sanankoro, initial drilling was completed 60 kilometres away at the newly discovered Tekeledougou prospect, also in the Yanfolila gold belt. Assay results have been filing in for the last couple of months from the never before drilled prospect and they have certainly exceeded expectations. The latest results released on 26 July delivered impressive high grades at Sanankoro, which have enhanced the potential for a large scale gold discovery. We will look at the assay results in more detail shortly. Furthermore, two new large-scale gold zones were discovered at Tekeledougou — Kouroudian and Woyoni — both with intersections of up to 102g/t gold, and within trucking distance (less than 10 kilometres) of Hummingbird Resources’ operating Yanfolila Gold Mine and its processing plant. This supports the potential early cash flow for Cora. Cora is awaiting approximately 900 assays primarily relating to Tekeledougou, indicating a raft of news flow to come during the current wet season. Going forward, Cora plans to continue exploration work at Tekeledougou as well as its flagship Sanankoro discovery and work towards delivering a Resource. These plans are supported by a Board and management team that have a proven track record in making discoveries and developing mines in Africa. 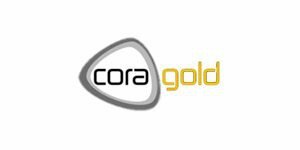 Valued by the market at just £8.95 million, Cora is a micro-capped AIM gold explorer that holds significant potential for its shareholders. It’s well on its way towards delivering multiple high value gold exploration and development assets, and is laying the foundations for future potential one million-ounce plus deposits. West African focused gold explorer, Cora Gold (LON:CORA), is honing in on two world class gold regions in Mali and Senegal in West Africa. These regions have gained quite the reputation as attractive mining destinations with a number of big name gold producers setting up operations in Mali. These include the £5.56 billion-capped Randgold Resources (LON:RRS) — which delivers around half of the country’s gold output, the £483 million-capped Resolute Mining (ASX:RSG), the £2.67 billion AngloGold Ashanti (JSE:ANG), the £2.07 billion Iamgold (TSE:IMG), and £1.33 billion Endeavour Mining (TSE:EDV). 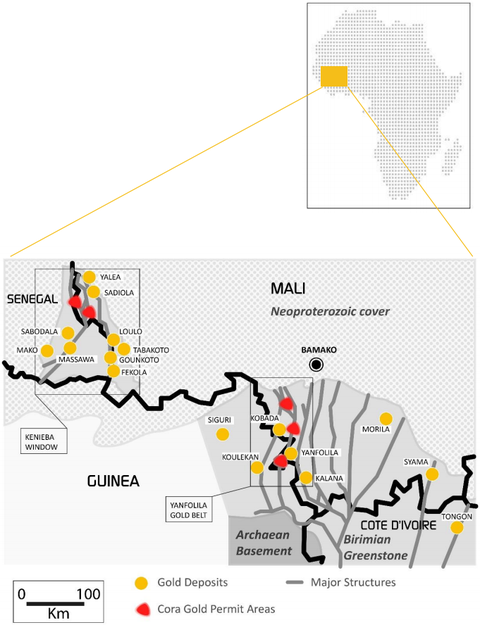 Cora holds interests in 14 permits in Mali and one exploration licence in Senegal, over an area of more than 1700 square kilometres. These permits are spread across two significant geological areas, the Kenieba Window in west Mali on either side of the Mali-Senegal border, and the Yanfolila Gold Belt in south-west Mali. Since its IPO in October 2017, Cora has concentrated its exploration efforts on two permits — its flagship Sanankoro discovery and the Tekeledougou Permit. 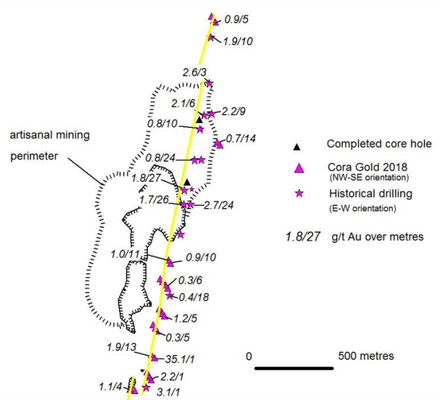 On February 2 we updated you on CORA’s activities with the article, Promising Assays Released From CORA’s Sanankoro Gold Discovery, and provided a summary of the highlights from stage 1 drilling at Sanankoro. That initial drill program delivered impressive grades of gold and vindicated the company’s current Sanankoro exploration strategy. Even having only completed stage 1 at the time, Cora was able to recognise the project as having the potential for standalone mine development. Since then, exploration has continued at Sanankoro with stage 2 drilling now complete too. 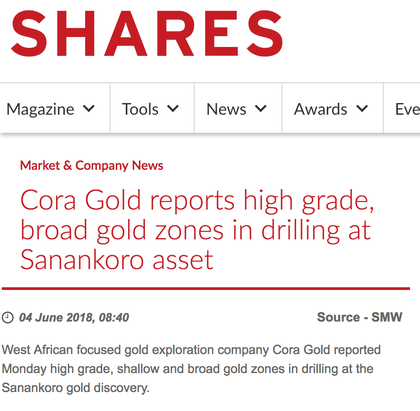 All up, Cora fast tracked exploration at Sanankoro, completing drilling stages 1 and 2 in around six months. 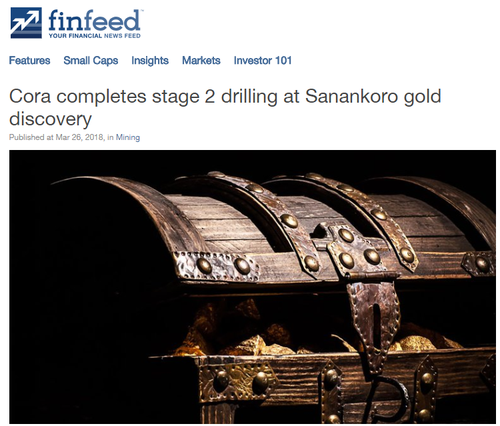 Following impressive results from stage 1 drilling at its flagship Sanankoro Gold Discovery in southern Mali, as reported in January, Cora finished stage 2 drilling in late March, as reported by Finfeed.com in the article below. Since that time it has been releasing impressive assays. 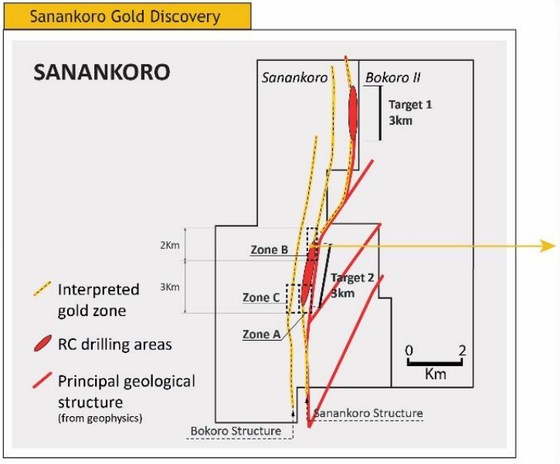 Initial assay results were received in April from a 5600m AC and RC reconnaissance drilling programme that targeted two structures at the discovery — the Sanankoro Structure and the Bokoro Structure (formerly Western Structure). Drilling targeted the connection of, and short extensions to, the north and south of zones A and B, aiming to extend the mineralised strike length to over three kilometres. 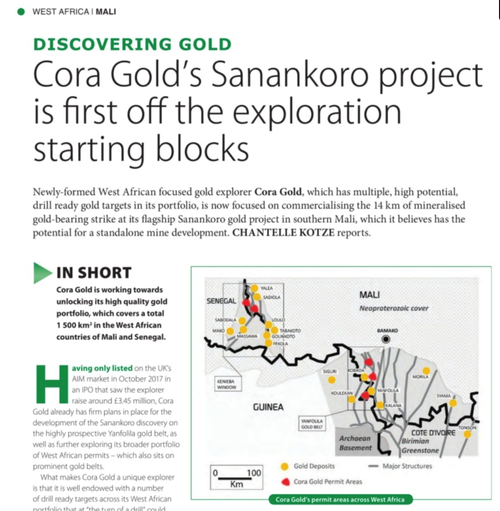 The identification of the 3600m long continuous gold structure highlighted Sanankoro's position as a new gold discovery and led to Cora determining that it has the potential to become a significant development asset. A ground Induced Polarisation programme was completed by contracting company, SAGAX, on 100m line spacing across much of the northern part of the Sanankoro Permit. This, along with pre-existing data from the central part of the Permit, provides a significant addition to the regional data held across the Permit and complements the surface geological mapping that has been conducted by Cora. Structural and geological boundaries are clearly defined with at least three 10 kilometre long geological structures that appear to control the gold mineralisation and will prove to be extremely useful in the planning and evaluation of drilling data. 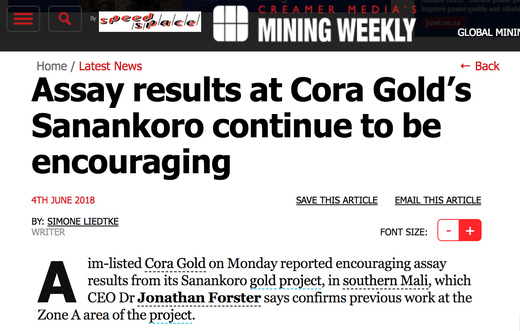 Further encouraging results then arrived on June 4, when Cora provided the most recent assay results from its Sanankoro Gold Discovery. including 3m at 2.5 g/t gold. 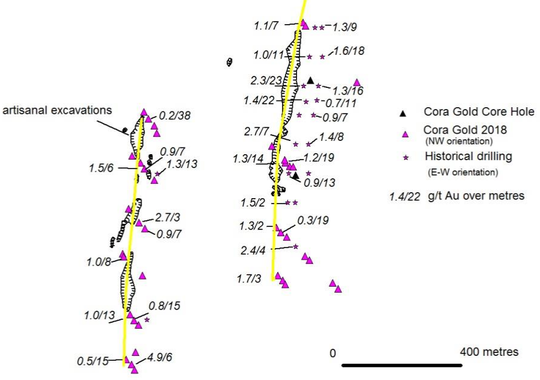 Additionally, confirmation core drilling in Zone A showed good correlation to historical drilling. 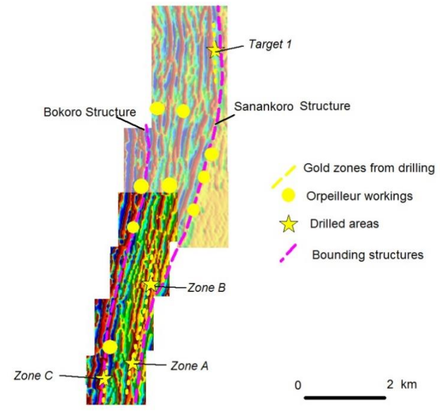 Gold assay results from a reconnaissance drill programme have now extended the Sanankoro gold zone to over five kilometres in length, from the southern end of Zone A through to the new extension confirmed north of Zone B. This news was well received by shareholders who sent the share price up 8% on the day. The latest results released just last week, confirmed the strike length has been extended to approximately eight kilometres indicating its large-scale potential. Drilling campaigns at both Sanankoro and Tekeledougou — which we will come to shortly — projects have now been completed with ~18,000m completed across both projects with further assays pending. Through the completion of the Stage 2 drill programme, Cora has now been able to join together the previous Zone A and Zone B mineralised areas defined by historical drilling and extend to both the south and north. 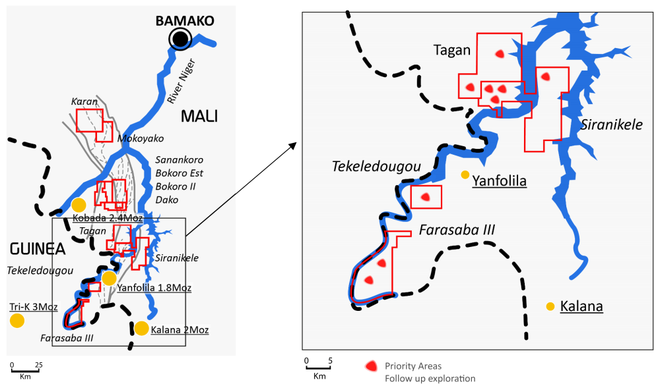 The three maps below narrow down the location of Zone B within the Sanankoro Gold Discovery in South Mali’s Yanfolila Belt. As it was drilling at Sanankoro, Cora conducted an initial 2007m aircore (AC) and reverse circulation (RC) reconnaissance drilling campaign at the Tekeledougou Permit in southern Mali. That campaign also delivered high grade drill results. The map below outlines known gold deposits, along with Cora’s gold permit areas. Note the Yanfolila Belt in Southern Mali as well as the Kenieba Window in west Mali, on the Senegal border. It may be worth familiarising yourself with the regions’ geology and Cora’s permits in question. 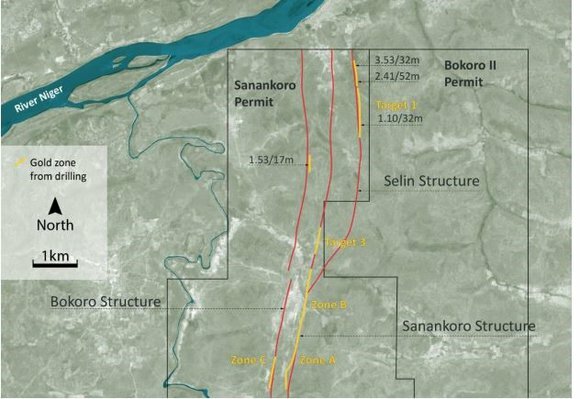 The Tekeledougou Permit, located just 60 kilometres south of the Sanankoro Gold Discovery and less than ten kilometres from Hummingbird Resources’ (LON:HUM) producing Yanfolila Gold Mine, is positioning to be a potential fast-route to cash flow for Cora. Tekeledougou is a highly promising prospect with two separate structures exposed — the Woyoni and Kouroudian Discoveries. One has over 600m of strike of an intensely veined quartz shear structure and the other approximately 200m of strike. Exploration to date points to these structures carrying significant gold mineralisation. The initial reconnaissance programme aimed to test and confirm the mineralisation of the structures and extend them along the strike where possible. As mentioned by Cora prior to the start of the initial drill program, the close proximity of the targets to Hummingbird's producing Yanfolila mine, suggests that if a significant discovery is made there is potential for early cash-flow by utilising the Yanfolila treatment plant. HUM is a 33.85% shareholder in Cora — a fact that inspires confidence in Cora from an operational point of view and as a promising AIM investment. As reported on May 1, the company received highly encouraging assay results from the initial 2007m AC and RC reconnaissance drilling at Tekeledougou — the first drill programme ever completed there. 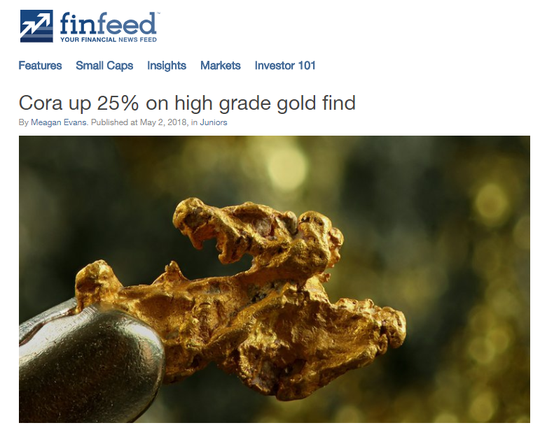 56m at 2.2 g/t gold, including 22m at 4.86 g/t gold. 60m at 0.7 g/t gold, including 9m at 1.30 g/t gold. The drilling confirmed a minimum strike length of 250m and is open in all directions. Drilling at Kouroudian confirms minimum strike length of 500m and clear potential to extend over one kilometre. The geology comprises well developed, stacked, sheeted and stock worked, predominantly east-west oriented intense quartz veining. The gold zone remains open in all directions and further historical artisanal mining extending some 200-300m to the north and well-developed quartz vein float a similar distance to the south highlight the overall strike length potential of over 1000m. As the headline suggests, shareholders were more than pleased with the results... and presumably with Cora CEO Jonathan Forster’s comments. Forster described the discoveries as “exciting” and holding “great promise for further development”. He explained that given the outstanding potential at Tekeledougou, Cora would promptly pursue these discoveries, with follow up infill and extensional RC programmes being planned, as well as some core drilling. A 2500 metre rotary air blast (RAB) programme has also been completed to investigate possible further extensions. Assay results are currently pending and will be reported when they come to hand, which shouldn’t be too long from now. The combination of superior gold mining location, a highly experienced African-focused team, and some impressive results from reconnaissance drilling at multiple targets are all reasons to have confidence Cora’s ambitions. While exploration programmes are still on-going at Sanankoro and Tekeledougou, even at this early stage it has been recognised that each has the potential for million+ ounce gold deposits in their own right. Systematic drilling has shown continuity of gold mineralisation and impressive grades, with consistently encouraging results from drilling such as the exceptional intercept of 35.7 g/t gold over one metre at the Sanankoro Structure. Having defined the gold zones at Sanankoro, the next step will be to target the higher-grade areas. While at Tekeledougou, recent drilling results, combined with its proximity to HUM’s processing plant, suggest early cash flow could be on the cards. There remain a multitude of exploration targets to follow up on and Cora intend to get to work before the wet season later this year — with an eye to potentially delivering a Resource.